Vietnam has called for ASEAN members to jointly address the region’s ongoing issue with landmines. Hundreds of people across Southeast Asia – often children or impoverished villagers looking for scrap metal –continue to be maimed or killed every year by land mines and unexploded bombs, despite a concerted effort by governments to rid the region of the scourge. It’s a point not lost on the Vietnamese, who are pushing the Association of Southeast Asian Nations (ASEAN) to take the lead on this issue and establish an expert panel to help resolve it. The initiative was put forward by Vietnam’s Deputy Defense Minister Lt. Gen. Nguyen Chi Vinh during a meeting of regional defense officials in Brunei recently, where he said such a move would also help maintain peace, stability and development within Southeast Asia. Land mines and other types of explosives have been left by an array of insurgent groups over the last half century, at times backed by the Soviet Union, China or the United States, as the vied for regional influence during the Cold War and after. The devices are still being used in some parts of Southeast Asia today. The reality for today’s generation is that land mines and UXO (unexploded ordnance) are an enormous problem in ASEAN countries. 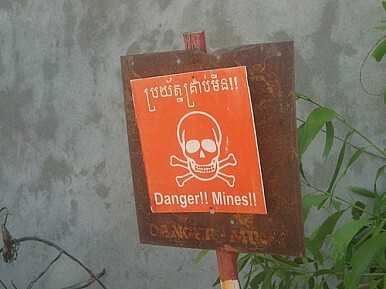 Of the 10 members of ASEAN, UXO remain a major issue for Burma, Thailand, Cambodia, Laos, Vietnam and the Philippines. More than 20 percent of Vietnamese land remains contaminated with mines, which have killed or injured more than 100,000 people over the years. The push for a region-wide panel came as Philippine authorities published the results of a survey that found 113 people have been killed and another 262 wounded over the last decade by mines planted by the Communist New People’s Army (NPA) in the country’s south. The NPA has run a communist-inspired insurgency on the island of Mindanao for almost 45 years and is just one of several outfits waging a rebellion in the troubled south. Authorities fear that a shortage of guns and ammunition is prompting the NPA to increase the use of mines and cheap improvised explosive devices (IEDs). Cambodia has long been the region’s unfortunate poster child for this tragic issue. Despite international efforts to ban land mines and other munitions like cluster bombs, however, Cambodia’s recent border conflict with Thailand at Preah Vihear proved such treaties were difficult to enforce. Journalist Hurley Scroggins and human rights groups found overwhelming evidence that Thailand had used cluster bombs as recently as early 2011, only further complicating efforts to clear Cambodia of UXOs. Divisions within ASEAN, ranging from different types of government to religious and ethnic differences, have cast serious doubts over ASEAN’s ability to act as a cohesive political bloc on the world stage. Perhaps Vietnam’s push for a regional initiative to resolve the land mine issue can change this picture by enhancing regional ties at a much wider level.